Example: You refer a friend who took GST ready Accounting subscription and paid Rs. 1499/- (after 70% discount) before tax, and you get a Rs.300/- cashback deposited in to your account 15 days after your friend's full payment. To Claim: Send referee (whom you are referring to) e-Mail IDs to gst@eztax.in to claim your eligible Referral Cashback. Referrer (generally 'You') must be a paid customer with active GST ready Accounting yearly paid subscription. Referee (generally 'Your Friend') must be paid, and good standing for 15 days for you to get the eligible Cashback. 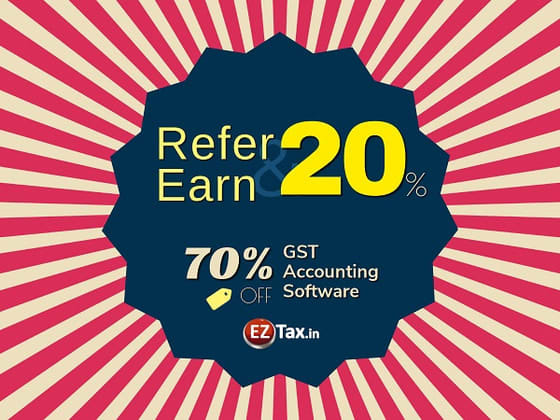 This promotion is only applicable for 'EZTax.in - GST ready Accounting Yearly Subscription' Misusing or Claiming a Referee that was not belong to you, disputed by the referee OR for an existing client lead to non-payment of such Cashback. Final discretion is with the MYD Labs Private Limited, EZTax.in management. Online Self Service income tax filing is 100% Free..... for any Income Level, and any source of Income including Capital Gains, Presumptive income, foreign income, brought forward losses. e-File in few minutes & get an Acknowledgment generated by ITD, comprehensive report from EZTax. Get the BEST for EZTax.in Self Service Income Tax Filing. For CA Assisted & Consultation services EZTax.in providing the a flat 15% discount for any Income Level, and any source of Income including Capital Gains, Presumptive income, foreign income, brought forward losses. All we need is brief information by uploading / sharing documents or an appointment thru EZTax.in! Get the BEST for LOWEST Price .. limited only until May 15th 2019. Our Experts will take care the rest to e-File your Income Tax Return!